Back again with me, Lina. It’s already 4 days (I guess) since I wrote something to you guys. Also, I am currently is in Holiday!! Whelp, hopefully all those hard studies that I put through are all worthwhile. So today, I will just talk about freshers week. One think that I remember so fondly is the fact that I got so many freebies. *ps: if I can explain it, it’s like KFC But not really. It’s a place for students to hang out. 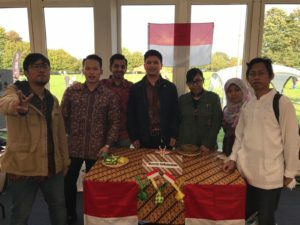 This is when I was with Indonesia Society! Become the SPG/Customer service! Helping them to advertise the society. 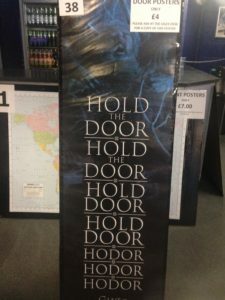 There was a poster kiosk too. You know, if you want to buy posters from fandom that you are in (not included Japanese posters), you can found it here. I think there will be one in next year too!! Have I told you about this travel card? Yeah. This is very helpful and I use this all the time. 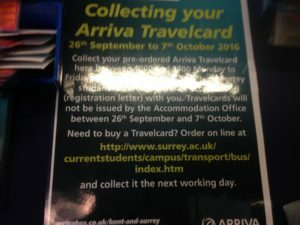 The point is, this travel card from Arriva (bus/coach service) will take you anywhere within Guildford and surrounding for free!! (Arriva service only). So, if you are lazy to walk or in need a quick way to places, this card is really helpful. The photo I showed you is the pamphlet to advertise the actual card! You can find this kind of pamphlet anywhere when there is a freshers week. 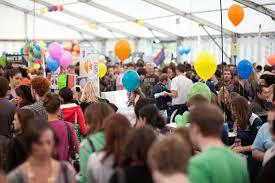 In the freshers week, Student Union will held many activities!! From activities from the like of Blind date, fetish party (similar to costume party) to a simple activity like movie night. But seriously it’s a hella fun! This also lasted within the fresher week!! At the end of the week, there will be some kind of bazaar for societies to introduce themselves by setting up kiosks and pamphlets about the thing they do. This is where the freebies come from! Every student, new or old, they likes to go here because the freebies they can get. Plus, it’s fun too. There were even a kiosk offering games for freebies. In that week, I met a lot of friends and get to know many people. Really enjoy the most of them. Anyway, reminiscing my first day in Surrey and looking back, I don’t regret anything. I hope I can go back and feel it again. Also, that’s all for now! I’m sorry for rambling and I hope I can get to talk more about more random stuff!